and arts; study and learning; and physical and political environment. Other than the stained-glass window, each class prepared a body sculpture to represent the value assigned to its grade level. "I thought the ArtsSmarts project was really fun, I really enjoyed it!" 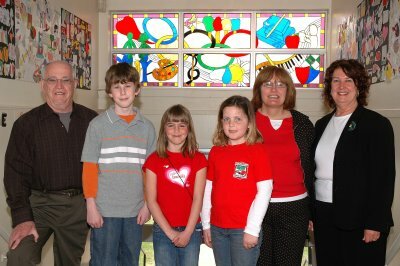 " We had so much fun doing the ArtsSmarts stained glass window project. It was really cool doing it with them." "The ArtsSmarts program is both education and creativity. You learn to work with your hands and with professionals. It has helped me with math greatly. It also brings great joy to everyone in Spring Park School!" "I think it was a good idea to do the six super spots of the six grades. We are lucky to have ArtsSmarts here. Thank you." Another positive point was the cooperation of the school, teachers, staff, and mostly the good behaviour of the children. "Any opportunity for children to express their creativity is greatly enjoyed and appreciated." "Great way for children to take pride and ownership in their school. Thank you!" "An excellent project that allows school children to contribute to the school decor." "My child was honored to be included in the stained glass preparation through the design contribution and thrilled to admire the finished work. A piece of him and his creativity will always remain at Spring Park! How rewarding! We feel that this has been a wonderful undertaking!"